Brands at times design two sided messages that include mentions of 'weaknesses' to project a more credible image to their target consumers. After all, there cannot be brand out there without any blemishes. The more infallible, the less believable. Quelling dissenting information is not a smart idea. Citizens don't like that. Ditto for consumers. Wikipedia scrubbing clean, information on Barack Obama may keep negative publicity away from a web page, but it can't quell renewed interest about that very same information in the minds of the average citizenry. Try and wipe a slate clean and you have more people curious about what was scribbled on, in the first place. WND reports that Wikipedia, the online "free encyclopedia" mega-site written and edited entirely by its users, has been deleting within minutes any mention of eligibility issues surrounding Barack Obama's presidency, with administrators kicking off anyone who writes about the subject, WND has learned. A perusal through Obama's current Wikipedia entry finds a heavily guarded, mostly glowing biography about the U.S. president. Some of Obama's most controversial past affiliations, including with Rev. Jeremiah Wright and former Weathermen terrorist Bill Ayers, are not once mentioned, even though those associations received much news media attention and served as dominant themes during the presidential elections last year. 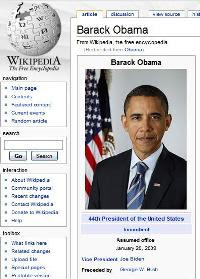 Will the Wikipedia act keep the Obama image rosy? Far from it, it will only fuel greater fires, greater interest to know what's behind the Obama image. What's real. Remember an example from your IMC class: Its always good to harp a bit on your shortcomings as areas of improvement which will enhance the credibility of the message. I think it is better to have a clear understanding of what is good and what is shortcoming and then let the consumer decide what he should be doing. The comparitive ads about the features of a car has one or two features missing but usually these are non-important ones when compared to the ones on which the brand in question scores over the others. I think Obama is missing this point. There is too much of positive feel that was generated and now with wiki responding in this way its the hit at the credibility. Bush was better at this. He allowed the dissenters to speak up, even make movies like 911, that only told people he was no different but he was doing something to keep them safe. I think over a period of time people will start to realize how bold and progressive his policies were.